An impressive backyard pool is the envy of many during a hot, humid New England summer – but why stop there? Pool house designs featuring amenities like outdoor showers, changing rooms, and even kitchens and living areas can elevate the backyard pool area from summertime staple to resort-like sanctuary. Not only does a pool house represent outdoor luxury, a thoughtfully and expertly designed structure functions as an extension of a property’s main dwelling. Pool house designs created with the same or complementary materials and details as the home make for an overall beautifully crafted, fluid property. Incorporate windows and glass walls where you can to let in plenty of natural light. Outfit your pool house with ample seating so it’s easy to spend an entire summer day lounging by the pool. Don’t forget about local zoning laws – make sure your pool house designs are up to code. Add a wide overhang to provide shade and open air shelter. Consider building in storage to house bulky pool gear. 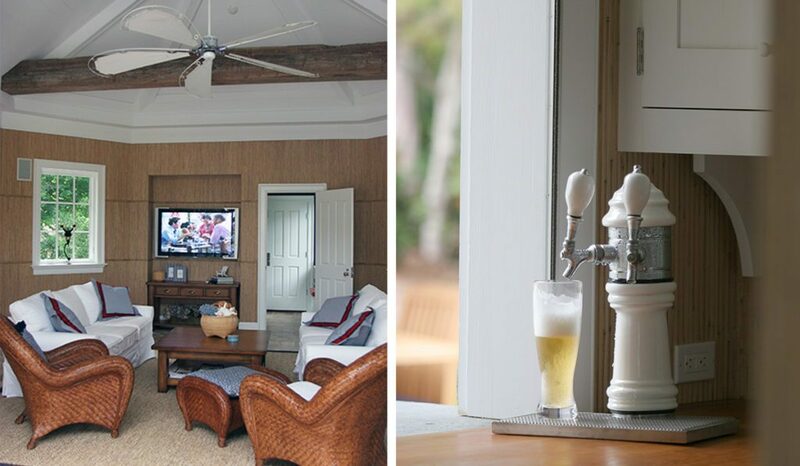 If you like to entertain, make sure the pool house designs are party ready. This may mean building in adequate living and entertaining space – you may even consider adding a guest room. Accent tables, a bar, WiFi, and a sound system will go far to ensure your backyard is the go-to spot all summer long. Don’t forget to include plenty of seating with waterproof surfaces so guests can go straight from the pool to mingling without needing to change out of wet bathing suits. With this advice in mind, draw inspiration from these exceptional pool house designs to create your own backyard retreat. This custom pool house in Darien, Connecticut features all the comforts of home, on a smaller scale. 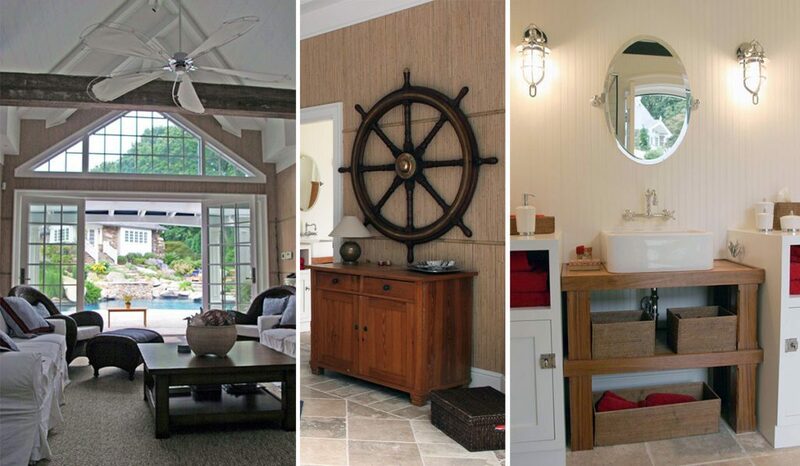 The client’s intent was to create a resort-like atmosphere, complete with features like a full bathroom and kitchen. The large living area opens up directly to the trellised terrace. The pool house may be designed on a smaller scale than the property’s main dwelling, but with stylish seating, a TV, and a mini tap, seasonal entertaining is simple. 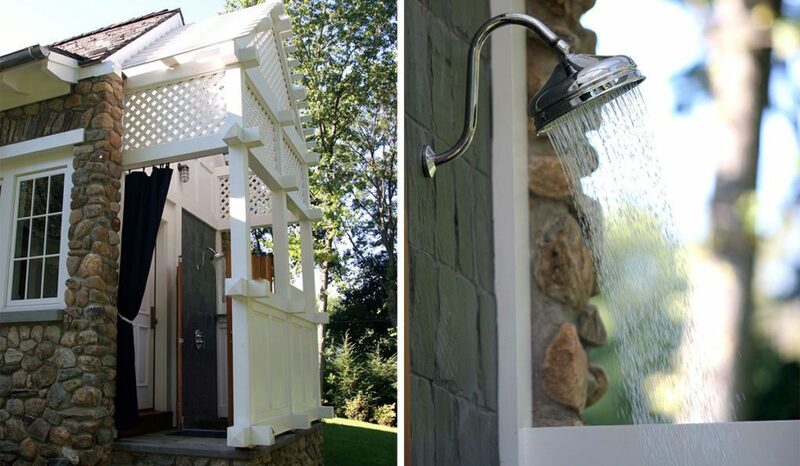 Taking the party from the pool to the pool house is made even easier with a laundry area, changing room, and a convenient outdoor shower featured in the rear of the building. Cardello Architects designed the pool house with the property’s main residence, a historic structure, in mind. 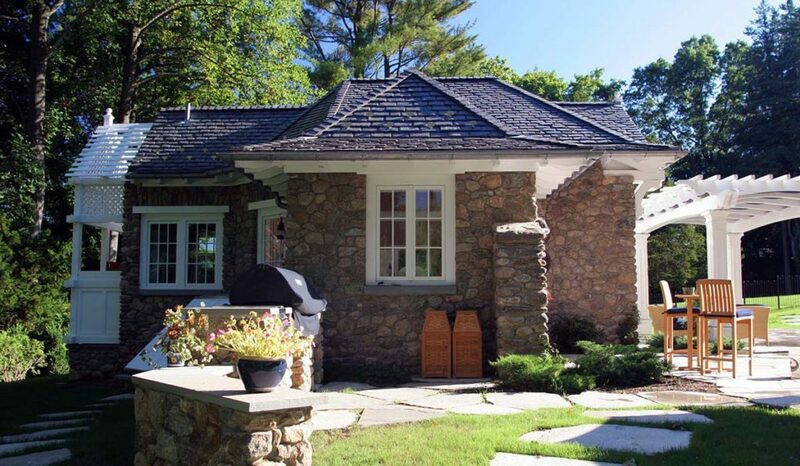 The pool house designs include material and character drawn from the main residence, like the exterior trim, stone, and slate roof. The architecture is complemented by the outdoor kitchen, organic pool and water slide. Like the Darien pool house designs, this Greenwich, Connecticut structure complements the property’s main dwelling in look and feel. Cardello Architects seized the opportunity to dive deep into time-honored architecture to bring the traditional Georgian home and pool house to life. The backyard oasis anchored by the exquisite pool house serves as the perfect extension of the home’s many playful features, including an arcade room, pool hall, ice cream bar, high-end theater and outdoor pizza oven. Whiling away summer days in a refreshing pool is one way to enjoy the outdoors. A pool house helps to extend that time outside by providing easy access to changing areas, a shower, and respite from the sun when needed. This Colonial home and accompanying pool house in New Canaan was designed for a growing family that desired more space while maintaining a strong connection to nature. Not only does the pool house offer convenience, but it also complements the main dwelling’s shingle-style architecture and serves as an elegant backdrop to the stately in-ground pool.